This week on Design Santa Barbara we are in continuing discussion related to the recent tragedies that have hit our community. 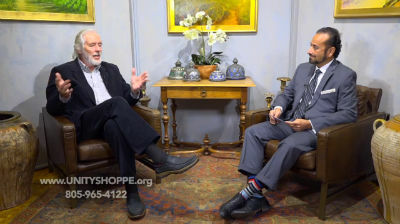 Earlier this season we welcomed Tom Reed executive director of Unity Shoppe in Santa Barbara discuss with us about the Unity Telethon. Just before the Telethon the Thomas Fire broke out and the Unity Shoppe sprung into action assisting the community in numerous ways. Tom was born in San Antonio, Texas and was raised in Michigan. He graduated from Michigan State University with a Bachelor’s degree in advertising, and served in the United States Air Force as a pilot during the Vietnam War. After relocating to California in 1974, Tom became involved in the non-profit world with local businessmen in northern California and Nevada. In January 2004, Tom became Executive Director of the Unity Shoppe, applying his public relations and fundraising experiences to raise awareness of Unity’s mission. With the proper space to improve services the staff was increased, more volunteers and charities became aware of the work, better and more consistant support services were available and more clients were referred. The Thomas Fire disaster caused the Unity shoppe to jump into action more than they could have imagined. When the Fire began two employees from the unity shoppe who live in the Ojai areas had to be evacuated at 3 A.M. It being a mandatory evacuation many people were not able to take much with them. Furthermore, some did not have time to grab anything at all. Unity put together a specials disaster service area over night. Putting together a starting inventory list for things that people will potentially need in case of any disasters and emergencies. In addition, those affected could come in and grab what they needed free of charge. Unity shoppe is designated by VOAD (Voluntary Organization Active in Disaster). Santa Barbara County VOAD is dedicated to improving outcomes for county residents affected by disasters by fostering “the Four C’s”—cooperation, communication, coordination, and collaboration. Among nonprofit organizations, community-based organizations, government agencies, and for-profit companies that are active in disasters. When the Thomas fire swept down from the Los Padres National Forest and took aim at this coastal town in December, the looming disaster was impossible to miss. Thousands of residents fled as what has become the largest fire on record in California pushed to the Pacific Ocean. More than two dozen homes were lost or damaged in the area. The mudslides that followed the fire was a much more stealthy and ultimately lethal threat. Hundreds of Montecito homes were damaged or destroyed by mudslides in the wake of the Thomas Fire. Many want to know how they could assist the unity shoppe during the disasters like the Thomas fire and Montecito mudslide. In this case receiving new things will help those who lost everything gain some dignity. The last thing people want is to be handed used clothes. When giving things to people that they would never choose. Then they have to be carrying around something that they wouldn’t have chosen. Though Unity shoppe appreciates all donations, the one thing they ask for is money donations to supply those with the things they really need. Whether its money, check or going to Unityshoppe.org to donate with your visa, American Express, or Mastercard. Another thing people can do to help assist the unity shoppe is buying fresh food to donate. When doing a food drive, unity shoppe has a food list on their website to go off by. This food list lets others know what the unity shoppe really needs and what is necessary for times like this. Help donate money to the unity shoppe during these disasters. “The Unity shoppe is dear to me and my family, where my kids have been volunteering since early age. Specially, I am proud of my daughter Nicole, who holds an annual bake sale benefiting the unity shoppe on the day of telethon at the Santa Barbara Design Center and raises money for this wonderful charity. At Santa Barbara Design Center we are dedicated to helping those affected in Santa Barbara’s recent tragedies, the Thomas fire and Montecito Mud slides. We are offering our services on Hand Wash and Cleaning , repair and restoration of rugs to everyone effected by the Thomas Fire and Mud Flood . Furthermore, as a small community it’s important that we take care of each other. We also wish to offer our appraisal services for insurance or legal needs at no charge. Lastly, if you have items lost or damaged beyond repair we can assist in highly personalized redesigning of your home.